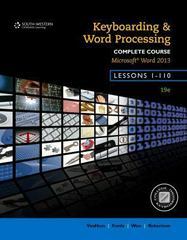 Keyboarding and Word Processing, Complete Course, Lessons 1-110: Microsoft Word 2013: College Keyboarding 19 Edition Get ready for academic and workplace success with KEYBOARDING AND WORD PROCESSING, COMPLETE COURSE, LESSONS 1-110, MICROSOFT 2013, 19th Edition. This market-leading text provides the tools you need to develop expertise in keyboarding, document formatting, and word processing skills using Microsoft Word 2013. To build proficiency in these critical job-ready skills, lessons are structured for maximum efficiency in learning and to encourage productivity. When coupled with Keyboarding Pro DELUXE Online (KPDO) web-based software you can work independently at home or at school with this easy-to-use integrated system.